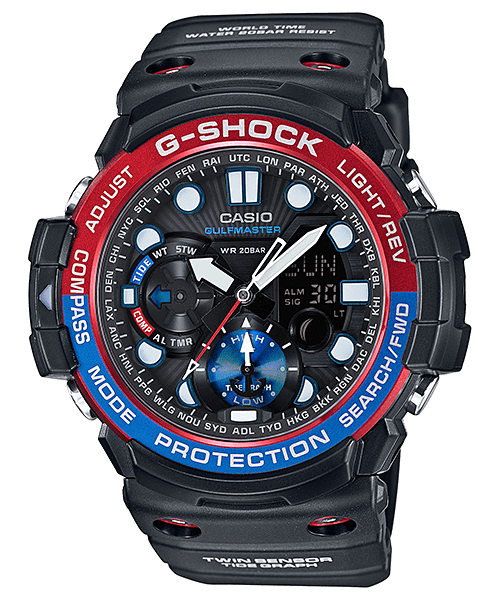 G-Shock Australia announced the GN-1000 Gulfmaster for an August 2015 release. 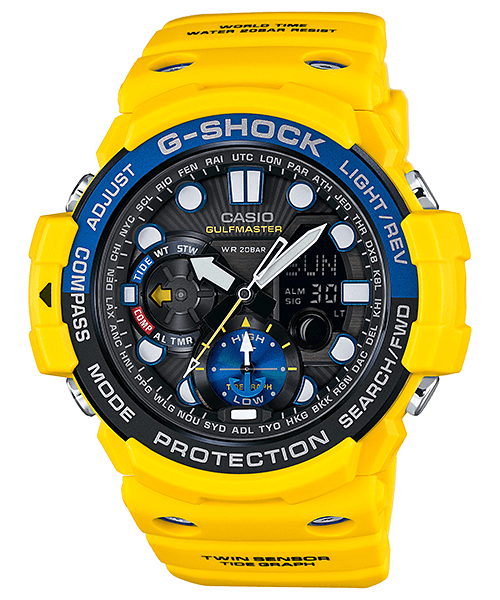 The design is similar to the GWN-1000 Gulfmaster with fewer features and a more affordable price. The GN-1000 measures 50.5 × 53.4 × 15.9mm. 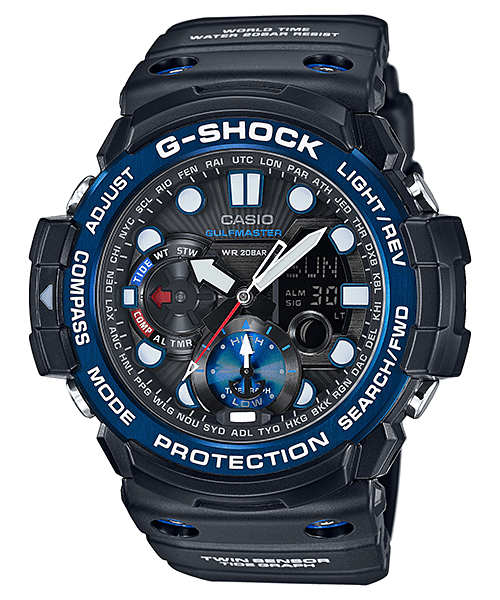 It is an analog/digital hybrid with a Twin Sensor (compass and thermometer) with bearing memory as well as a tide graph and moon age graph. 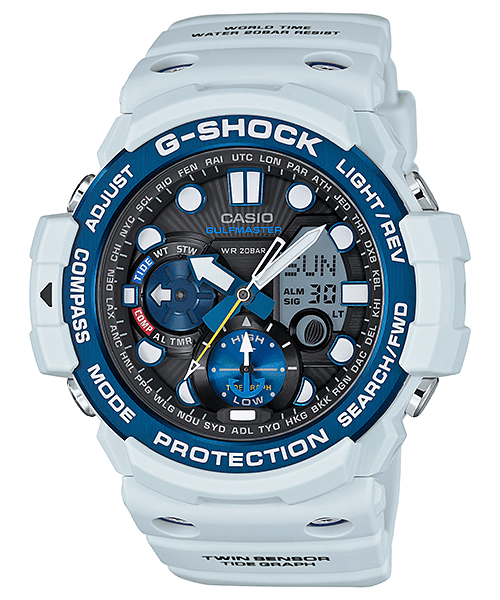 Unlike the GWN-1000 the GN-1000 does not have Tough Solar or Multi-Band 6. Battery life is rated for 2 years. 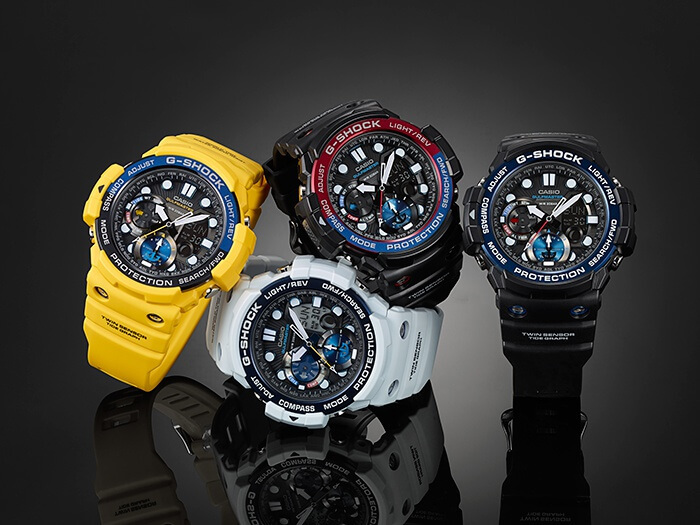 Model numbers are GN-1000-1A (black with red/blue bezel), GN-1000B-1A (black with blue bezel), GN-1000C-8A (whitish “ice gray” with blue bezel), and GN-1000-9A (yellow with black/blue bezel). North American releases include the GN1000B-1A and GN1000C-8A with a retail list price of $300. 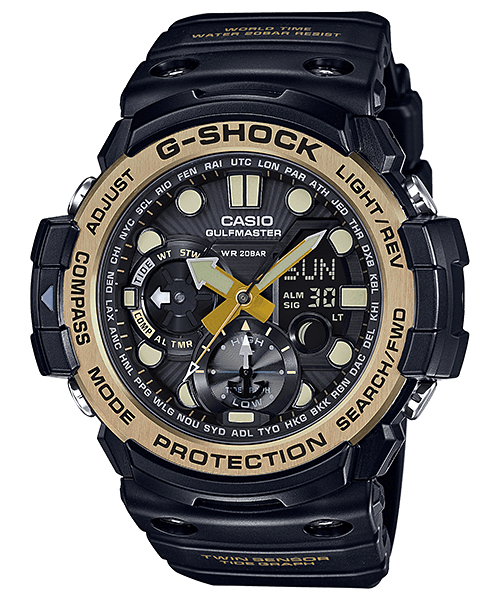 With gold bezel, released July 2016 as part of the Master of G Twin Sensor Black and Gold Series. I have had the same G-Shock now for 17 years and still working brilliantly. I use it diving, hunting, working in the Police – including Marine work, farming etc and replaced the battery once that I recall (this has the solar charging). The strap has been replaced once and now the plastic face has been ripped off as has the button covers – but it still keeps excellent time and I still use it for the gym, running and fishing. They are awesome watches and I will definitely look to replace it with another, once it actually dies. The limited GA-2000E-4 (left) also includes a black resin band and green cloth band.